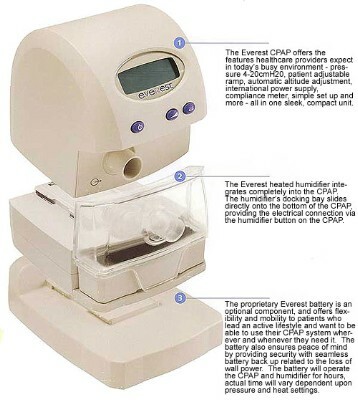 The Everest 3 CPAP machine by AEIOmed is the same basic machine that was previously marketed by AEIOmed as the Everest Aura and by Invacare as the Polaris TR. Evo has made some minor changes to the design of the machine to make it quieter and to give it the capability of recording compliance information. The Everest 3 boasts several improvements over the Everest 2: a two decibel decrease in sound level, additional efficacy data storage capability, and the machine will now automatically turn off the humidifier when the battery level becomes low while running on battery power, which will increase run time. The Everest is billed as the first fully-integrated battery-powered CPAP unit. It's main attraction is the battery pack and charger, which enables the user to take it anywhere - whether you're sleeping in a tent, on a boat, or while traveling in a plane or automobile. All of this can be done simply by using the optional battery pack, which precludes the hassle of finding a 12V DC outlet or finding the correct invertor. The Everest is compact, measuring 5" x 6" x 5", and light at just 2.1 lbs, but it's also fully functional with a wide pressure range (4-20 cmH2O), adjustable ramp settings, automatic altitude adjustment, leak compensation, compliance meter and of course a quick and simple set-up. The most unique feature of the Everest is its rechargeable battery pack! The battery pack is an integrated unit weighing just 1.58 lbs that fits onto the bottom of the Everest system. With the battery pack attached the Everest can be used for up to 11 hours (at 10 cmH2O) without needing to be recharged or plugged in. So whether you want to go camping, sleep on an overnight flight, or simply ensure that no matter what happens you'll get a peaceful night of uninterrupted therepy the Everest with battery pack is a great option! An integrated heated humidifier option rounds out the Everest CPAP system. Clinical research has shown that CPAP patients tend to be more compliant with the addition of heated humidity. The Everest heated humidifier provides just enough water for one night™s use, and the reservoir is simple to fill and clean. An indispensable feature that makes traveling with this system even easier! Recharge your battery using the 12V DC power port (cigarette lighter) of your car, boat or RV. You can also run the CPAP and humidifier directly using this cable. I have used a CPAP for 9 years. I have not been able to use my previous one on our boat due to lack of AC power. I can get 2 nights on the battery pack, the unit is quiet. It's the best CPAP I have ever used! Only change I would make is to make the volume of the humidifier larger.